Cardinal Kurt Koch of the Vatican will visit Emory University for two lectures Sept. 18 and 19 examining interfaith and ecumenical efforts in the world today. The lectures are hosted by the Aquinas Center at Emory’s Candler School of Theology. Koch serves as president of the Pontifical Council for Promoting Christian Unity and president of the Pontifical Commission for Religious Relations with the Jews. His presentations will elaborate on his Vatican positions, his commitment to ecumenical dialogue, and insights from Pope Francis on interfaith endeavors. Both events are free and open to the public, with advance registration required. On Sept. 18, Koch will present “Toward Full Communion: Hopes, Achievements, Obstacles and Challenges” at 7:30 p.m. in the sanctuary of Glenn Memorial United Methodist Church on Emory’s campus. The lecture is the first in this year’s Major Catholic Speaker series, presented annually by the Aquinas Center. Register here. A native of Emmenbrücke, Switzerland, Koch studied theology at the University of Munich and the University of Lucerne. He became professor of dogmatic theology and liturgy at the University of Lucerne in 1989, and was named rector of the faculty of theology in 1995. 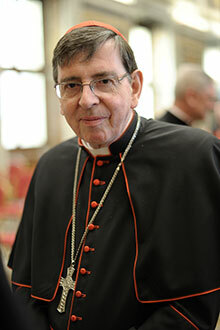 Later that year, he was appointed bishop of the diocese of Basel. From 1998 to 2006, Koch served as vice president of the Swiss Bishops’ Conference and then as president from 2007 to 2009. He was appointed president of the Pontifical Council for Promoting Christian Unity in 2010, and participated in the 2013 conclave that elected Pope Francis. Koch’s visit takes on added significance as Candler’s new Catholic Studies program launches this fall, preparing leaders and scholars for ministry in the Catholic Church and research in the Catholic intellectual tradition. Long considered dry ground for Roman Catholicism, the South now has 27 percent of the nation’s self-identified Catholic population, according to the Pew Research Center’s 2014 Religious Landscape Study. There are more than one million Catholics in the Archdiocese of Atlanta.